'I called in to 'Freedom Cycles' with a simple question about replacing a brake component on my Brompton bike which Brompton had been unable to fix. Within ten minutes Gary had replaced the broken part and then, observing that the chain tensioner wasn't functioning correctly set about improvising a fix for it which looks as if it will outlive me. It was with the greatest of difficulty that I could persuade him to accept any payment for what must have amounted to 45 minutes work. This, quite frankly is unheard of service in this day and age (and probably any day and age) and will have me making the Birmingham to Litchfield trip far more often.! Bravo Gary and Debbie! This morning I had occasion to use your services when I had tried but failed to fit new tyres to my granddaughters bike. I would like to express my most sincere gratitude for the excellent service that you provided. Not only was the task completed in record time but it was all done with a smile and a cheery word. Brilliant, I would have no hesitation in recommending you to anyone. Thank you for all you help and providing me with such a great bike and kit i have been out on it twice and i am really enjoying it... apart from a puncture last night! But thats all part of the fun. I had a great race today in the West Midlands CCX League Round 1 at Redditich. My new bike rode perfectly. I won the U14 and although i started 1 minute after the U16s i came 4th in their race too. Loved the FOCUS. But i knew i would! Outstanding service. They really know how to help you and have an excellent knowledge and understanding of bikes & maintenance. I always feel they will help you out regardless of the size of the job. The prices are very reasonable and you never feel 'ripped off''. Overall, an outstanding local business run by very friendly and passionate people. Freedom Cycles is the friendliest bike shop for miles and Debbie and Gary are able to give great unbias advice. They run a well stocked shop and show a real passion and great knowlege about everything to do with cycling! Well worth a visit even if it's just for a chat. Now my No1 place to go for all my bike needs. My bike's chain kept falling off so brought it to freedom cycles and they had it straight up on a stand and assessing the problem. They fully explained that it needed a new bottom bracket and gear set, I didn't even know what these were before entering the shop but they kindly took me through to the back of the shop and educated me. Left my bike with them to fix and they called me on the monday (i took it in on the saturday) to say it was all fixed and ready for collection. I was happy to pay the very reasonable price for the amazingly high level of customer service, knowledge and professionalism from all member of staff, especially Debbie who look after me start to finish. In summery for all your bike needs you HAVE TO make this your first point of call!! Extremely highly recommended. 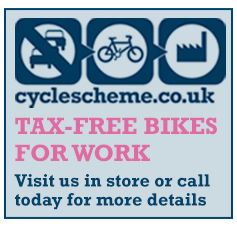 Great bike shop situated near the centre of Lichfield with extreamly helpful service and people passionate about bike running the shop. Recommended. Great service, friendly knowledgeable staff. Excellent product choice and easy to find. Would definitely purchase again from Freedom Cycles.